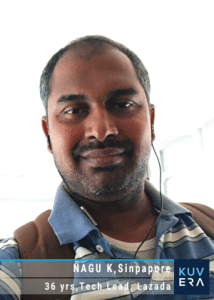 Nagu is a Happy Kuverian and a global tech citizen having worked in India, Riyadh and Singapore. He is currently a Tech Lead with SEA e-commerce giant Lazada in Singapore. We spoke to Nagu about his experience with Kuvera, India’s friendliest Direct Plan Investment Platform. I grew up in a village until 10th standard. Then we moved to a city where I completed my masters in engineering. Like most engineers, I started my career in the IT industry as a software engineer. After working for a few years in Riyadh, I am currently a Tech Lead with the e-commerce giant Lazada in Singapore. Until last year, I did only conventional investment – banks, post office etc. Last year I started investing in Mutual funds and it has worked for me so far. As I get more comfortable, I am slowly increasing my investments in Mutual Funds. I work for a startup that has seen significant success recently. So I searched for an online Mutual Fund investment startup and found Kuvera. From the beginning of my interaction, I have found everyone at Kuvera as knowledgeable and humble. I have been investing in Mutual Funds since past one year. Though I knew of Direct Plans, neither my bank or any agent would help me invest in them. I had to deal with the corresponding Mutual Funds directly, and it was cumbersome. As a non-resident I value the convenience of interacting with only one platform, along with all the other benefits of advice and planning. I am a relatively new investor and I am slowly building my knowledge about Mutual Funds. I found the banks and agents more focused on selling me Mutual Funds but not as interested in educating me about aspects of investing, such as allocation, volatility, risk-reward or fund selection. The last one was particularly problematic as there are so many fund schemes to chose from. Kuvera is wonderful company, to help meet my financial goals and plans. The folks from Kuvera are very humble and always reachable for any help to resolve my queries. From the beginning of my interaction with Guru, Neel or Gaurav, they always try to help as soon as possible. I have met Gaurav in Singapore, and he is very knowledgeable person. He shares his knowledge and experience with me, which I believe will help me become a better investor. I want to learn more and want to invest more into equity. Through Kuvera, I am planning for a vacation, retirement and my kids education. I have continued with the Direct Plans of some funds that I have invested in before and have added some funds as recommended by Kuvera. 100% I will recommend them. I have already recommended them to my friends, even before I wrote my story for the Kuvera blog. I want my friends, colleagues and other to also get the benefit from Kuvera’s expert advise and direct plan platform to help meet their financial goals.